Here is a chart with pronunciation for each day of the week. 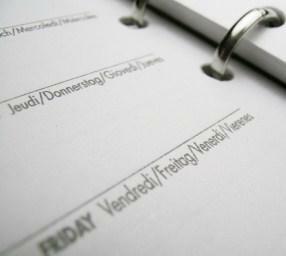 Notes:Days of the week are not capitalized in French. Talking about what you're doing when can be very valuable if you're trying to live and study in France. Use this chart to learn useful expressions to help you communicate what you're doing when! Now that you have the days of the week, you're ready to talk more about your schedule by adding adjectives of time to your sentences. Je suis chez ma cousine depuis deux jours. I have been at my cousin's house for two days. Nous avons passé la journée à la plage. We were at the beach all day. when talking about the date: Quel jour est-il? with numbers: Cinq jours de maladie. Je travaille toute la journée, lundi. Je travaille tous les lundis. Nous allons au ciné mardi prochain. Le dimanche dernier nous sommes allés à l'èglise. Le dernier dimanche du mois, nous allons toujours à l'église. Learning to communicate about what will be happening when, is especially crucial for helping to keep schedules strait while visiting a Francophone country. Whether you are a there for business, a tourist, or a student, learning these simple phrases will serve you well.